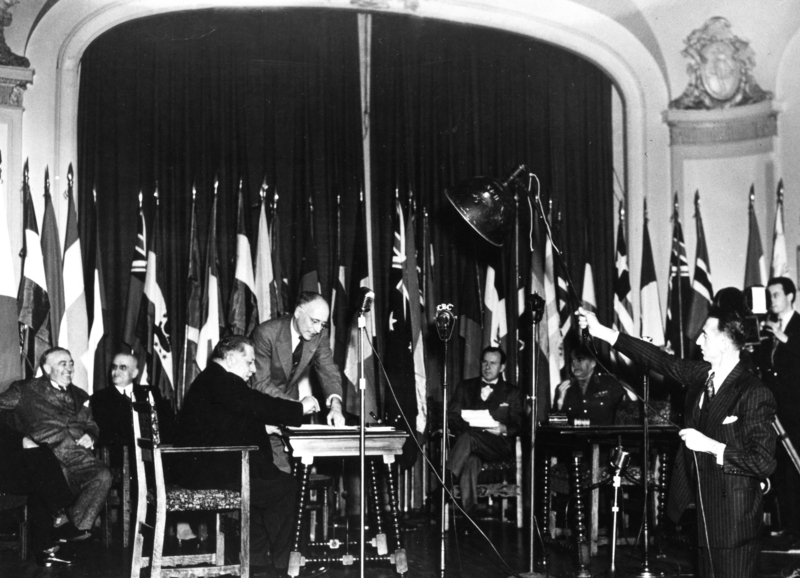 October 1945, Quebec - United Nations Food and Agriculture Conference in Quebec. Representatives of nearly 40 nations met at Quebec and formed the Food and Agriculture Organization FAO of the United Nations. The post-1929 world depression had a devastating effect on agriculture and left the farming community on its knees. The financial crisis saw food-importing countries hastily raising tariff barriers and increasing their national food production. With a 60 percent drop in wheat imports, trade collapsed and food surpluses abounded. As new findings on poverty and nutrition were revealed in the 1930s, nutritionists were calling for increasing consumption while economists pushed for decreasing production. This paradox was analyzed by the Australian nutritionist, Frank Mc Dougall, who advocated to ‘marry health and agriculture’ and to bring together various disciplines to address the issue of malnutrition. His proposals were widely accepted by governments and the public alike and the time seemed ripe then for collective action but unfortunately, the Second World War halted any further progress. In 1942 McDougall’s proposals eventually found their way into the hands of the First Lady, Eleanor Roosevelt, who arranged for him to meet the then US President. During a dinner at the White House, McDougall passionately called for a United Nations programme to tackle food as its first global economic problem, envisioning agriculture as critical in raising the life standards of people throughout the world. 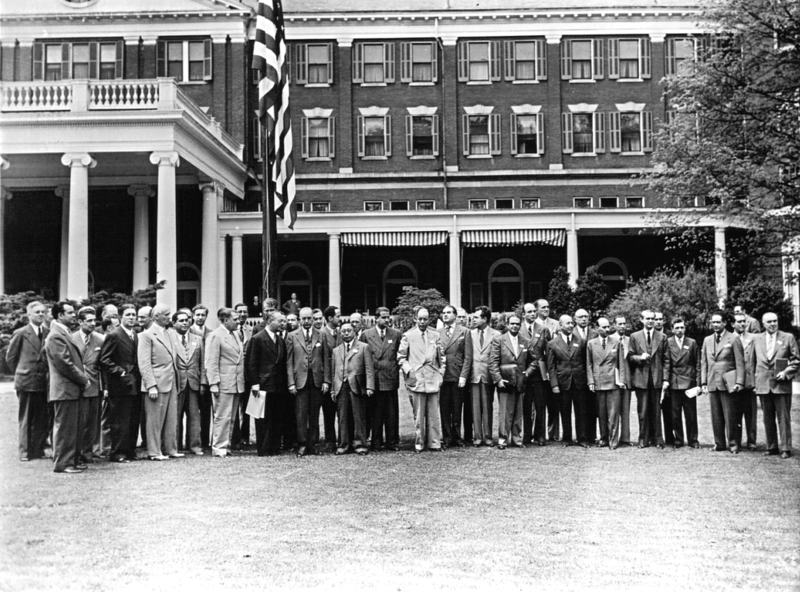 President Roosevelt showed no reaction, but the discussion of that dinner must have struck a deep chord as a year later, he convened the United Nations Conference on Food and Agriculture, in Hot Springs, Virginia, where forty-four governments committed themselves to founding a permanent organization for food and agriculture. Quebec, 1945 - FAO agricultural committee in session. The creation of FAO could not have come at a better time: with Europe in ruins, hunger had become a real threat to many. At that meeting, the first Director-General was also elected, Lord John Boyd Orr, a Scot, who was widely admired for his extensive work on nutrition. A year after its creation, FAO still needed to prove to governments that poverty lay at the root cause of hunger and malnutrition. In early 1946 it was clear that a combination of dislocation and drought would seriously endanger people’s access to food in the following years. FAO estimated that there would be a massive gap between people’s needs and food supplies in the 1946/47 crop year and urgently recommended a number of measures. 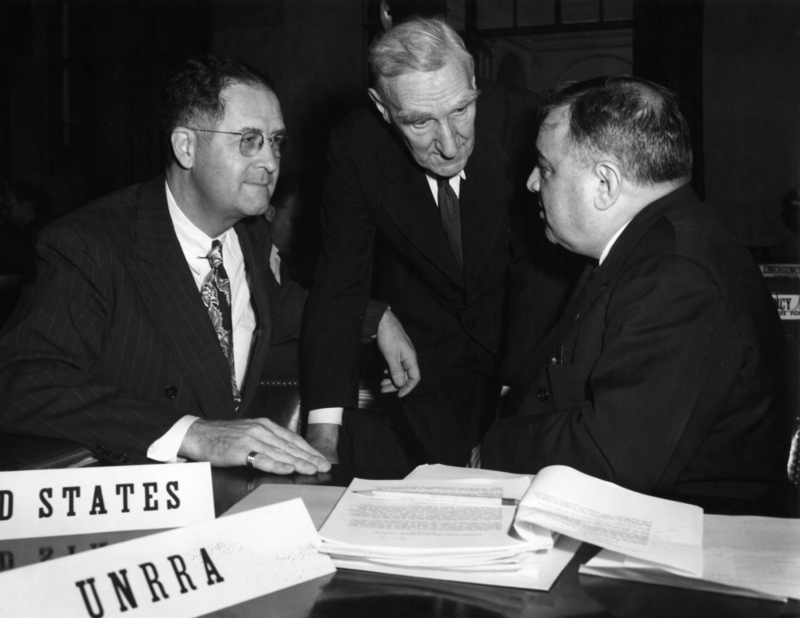 This is why FAO convened a Special meeting on Urgent Food Problems in Washington on May 1946. The meeting not only tackled the immediate food crisis but also prepared a set of proposals for dealing with old-age issues related to food production. Undertaking world censuses regularly, dealing with plants pest control and responding to emergencies with food relief were some of the key issues addressed by. At that meeting, improving soil fertility was seen as one of the most pressing issues to be addressed. 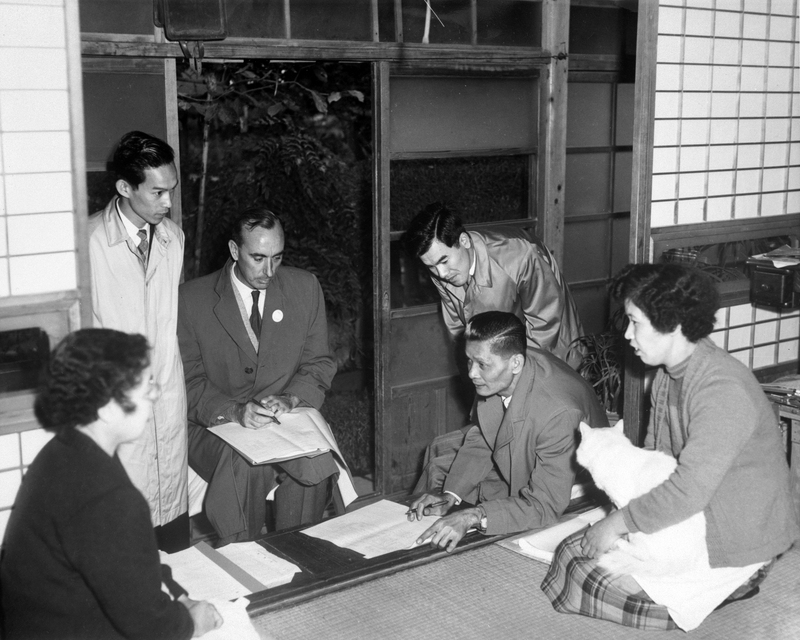 1958, Japan – First World Agriculture Census. 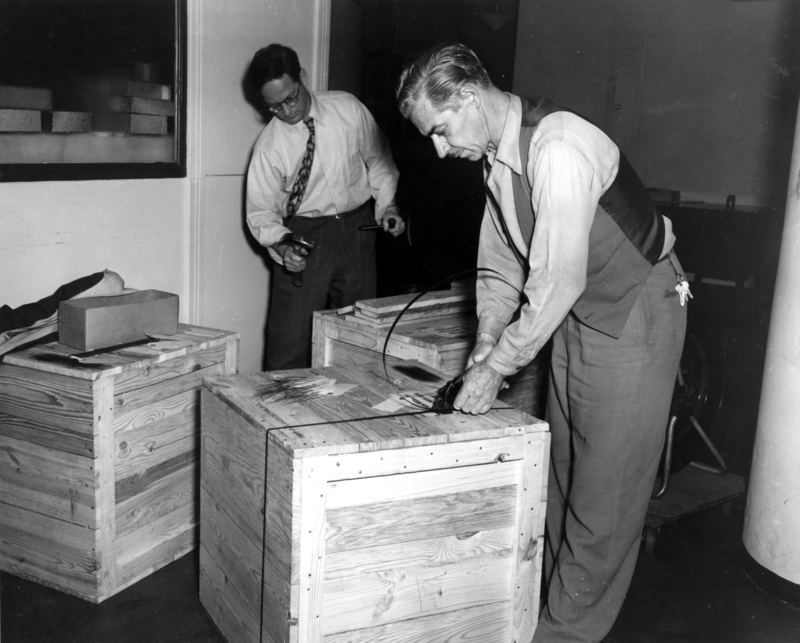 Pictured: Employees of the Census Training Center for Asia and the Far East. After World War II, there was a need for replenishing soil fertility in many countries. Nations were interested in increasing their crop production. Farmers that had been able to attain high production during the war period, wanted to maintain the same level after the war, especially at that time of favorable prices for farm produce. This translated into a surge of demand for fertilizers worldwide: governments had to cope with an increased demand for food and needed to understand where their countries’ agricultural economies stood if collectively, they were to improve their agricultural production. FAO was asked to coordinate the development of the 1950 World Census of Agriculture. The Census was the first programme to compile statistical information on 81 countries providing a complete and current picture of agricultural production and its structure. It was a considerable evolution from previous pre-war census. Although by the late 1940s the post-war food crisis was ending, this did not mean any diminishing of interest by FAO, the United Nations and other organizations, in dealing with food emergencies. In August 1951, the United Nations Economic and Social Council recommended that FAO should keep the situation in individual countries under continuous surveillance and report any instances of “pending critical food shortages or famine”. This meant that FAO could perform on-the-spot investigations and convene meetings with governments ‘to devise the most practical lines of action’. 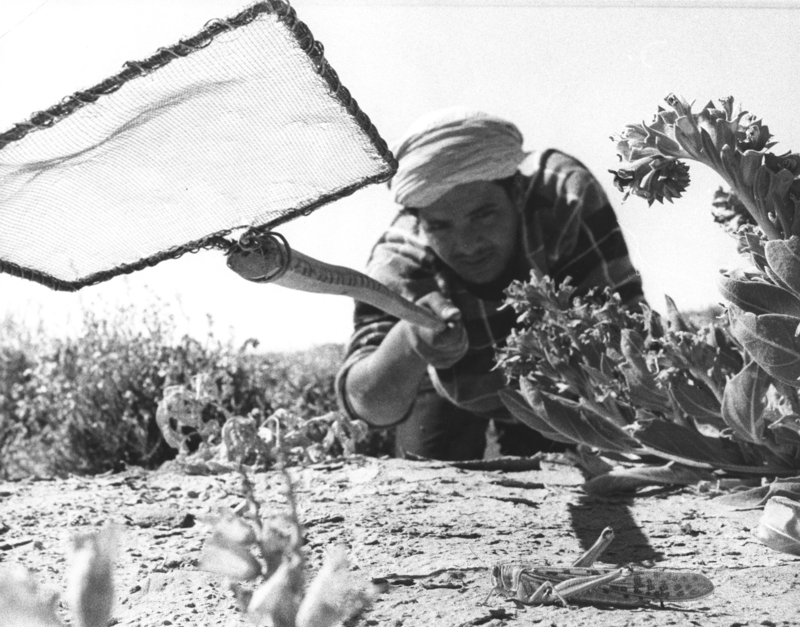 It also meant that FAO began to study the viability of establishing a food reserve to be used in cases of serious food shortage or famine caused by war, natural catastrophes or also infestations of pests such as the Desert Locust. 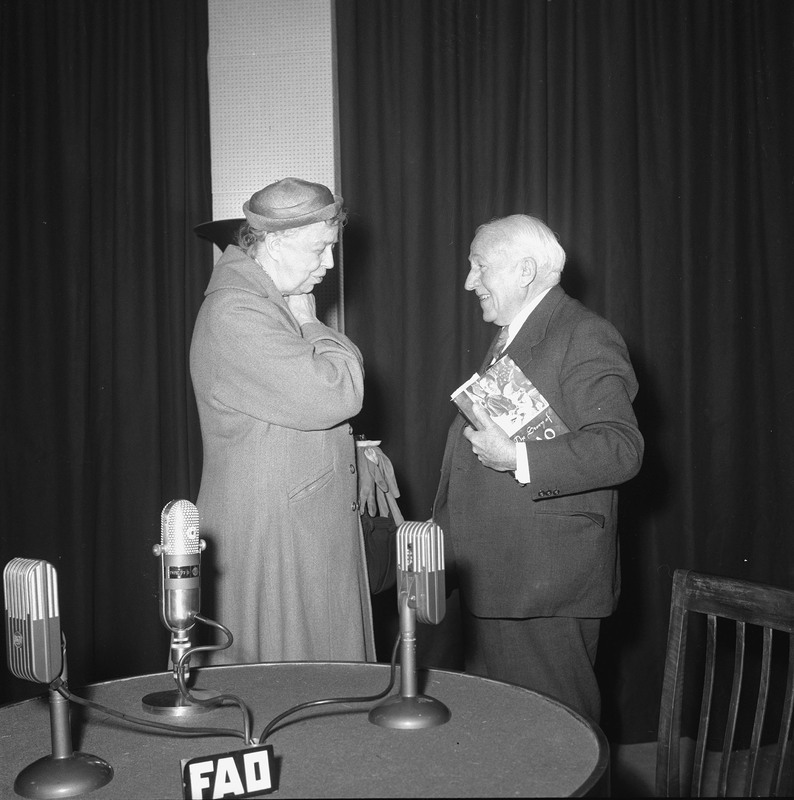 The thorny issue of plenty among the needy is one which FAO worked hard to address in 1950s. While the risk of famine, catastrophes and pest infestations was still prevalent, food surpluses were building up in developed countries. There was a need to mobilize them in those countries in need, making sure farmers could benefit from appropriate mechanisms that would ensure that the prices of their produce remained competitive. FAO's Committee on Commodity Problems drew up the Guiding Lines and Principles of Surplus Disposal. Adopted by the FAO Council in 1954, the Guiding Lines and Principles were designed as a code of international conduct. They encouraged the constructive use of surplus agricultural commodities and at the same time, safeguarded the interest of commercial exporters and local producers. The Guiding Lines have been used ever since by food aid programmes as an effective code for monitoring food and agricultural commodity assistance initiatives.